We anticipate registration opening for our 2019 summer camp series by the end of March. We will be offering three types of camps this summer: specialty 2 day camps (shooting, point guard, and big man), elite invitation only 3 day camps, and our 5 day camp. Area varsity coaches are providing the instruction. We believe to provide the best developmental opportunity, professional coaches are required. What level of skill does my child need to attend? We get this question often and it’s not about being ‘good enough’. If you are a dedicated player who loves the game and wants to improve, you’ll fit right in, no matter your skill level. If you’re not interested in learning the game and developing, our camps are probably not for you, regardless of how good you are. What can my child expect from the drills? The drills are designed to provide development in the fundamental skills needed to succeed. Players of all skill levels will be challenged. If a drill is easy, the player is not learning. Additionally, the drills will be able to be taken home so players can continue to develop their skills. What is the competition level like at each session? 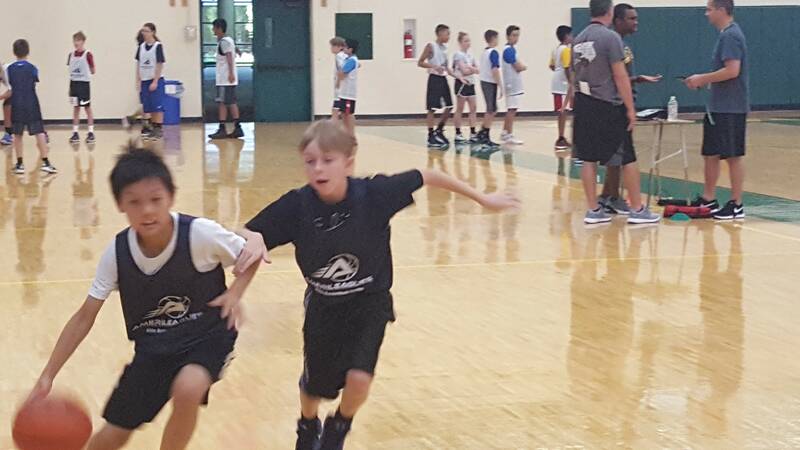 While the level of competition may vary slightly from camp to camp, there is nearly always suitable competition for the varying levels of the players. We do place the players in competitive situations, but understand the intention of the camp is development and learning, not competition. What is the off court session? We believe that sports provide a development opportunity beyond the court. We will discuss leadership, being a great teammate and character traits such as, trust, resiliency, and commitment. We are excited to offer this in our camps and believe this will give the campers a positive perspective on taking on the challenge of succeeding. Why do you offer a 100% money back guarantee when no other camps does? We are dedicated to the development of our campers and simply, believe in our camp. Our guarantee is our way of holding the camp to a higher standard and providing a great experience for every camper. I've registered, when will I hear more about the camp? We will send an email out one week before the start of the camp to all campers who are registered and have paid. This email will contain information about parking, how to access the gym, and when you should arrive each day, along with more information about the curriculum. If you have any questions in the meantime, you can contact Ben Goodyear ([email protected]). No refunds will be given within 30 days of the start of the camp unless the camper suffers an injury that prevents him/her from participating. A doctor's note must be submitted to Amerileagues before a refund (full - $20 cancellation fee) will be given. All refunds must be requested in writing. Our 100% money back guarantee is available for campers that have completed our camp and were not satisfied with it. Registration and check-in will open at 8:30 AM for the morning session and 12:30 PM for the afternoon session. Camp will start promptly at 9:00 AM for the morning session and 1:00 PM for the afternoon session. Camper Equipment: We will provide basketballs for warm-ups, drills, and games. Campers do not need bring a basketball to camp. Amerileagues is not responsible for any missing equipment. Viewing Area: For the safety of all of the campers and hosts, we ask that guests stay off of the courts. Guests are welcome to view camp from the designated viewing areas. Emergency Contact Form: Please complete the emergency contact form sent to you via email and bring it to camp check-in. We need an emergency contact form for every camper.